The GX1120 is a high performance, two-channel PXI arbitrary waveform generator that offers function generator and arbitrary waveform generator functionality within one instrument. Built-in waveforms are available for use with both the DDS or AWG modes of operation and include Sine, Triangle, Ramp, Noise, and pulse waveform generation. With a sample rate of 250 MS/s for each channel and with the ability for the two channels to operate synchronously and phase coherently, the GX1120 is an ideal I/Q modulation source for communication applications, troubleshooting encoding schemes, and verifying modulator performance. Additionally, the GX1120’s two channels can be combined to produce 400 MS/s arbitrary waveforms with 16 bits of vertical resolution – offering an extremely high performance, high resolution waveform generator in a compact, 3U form factor. Each channel is fully independent and offers programming of the channel’s sample clock, output level, waveform and offset settings. 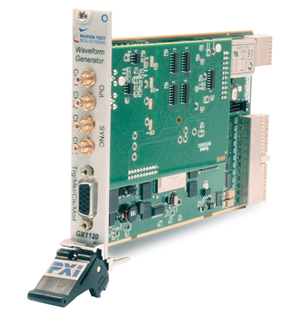 The GX1120 comes standard with 32 M samples of waveform memory. The GX1120 can be triggered via a software command, a PXI trigger event, or an external trigger input, offering users the ability to control waveform generation via external trigger events. The waveform trigger modes include continuous, triggered, gated hold, and burst functionality. An internal 50 MHz clock reference is used to create the 250 MHz clock for DDS mode. For Arb mode, two independent PLLs are used to drive each arbitrary waveform generator with a maximum sample rate of 250 MHz. The PLLs can use the internal 50 MHz reference or they can be locked to the PXI 10 MHz clock. The sample clock can generate sample frequencies with 4 digits of resolution or 10 ps of resolution. The board is supplied with GtWave, a software package that includes a virtual instrument panel, a Windows 32/64-bit DLL driver library and documentation. A trial license for WaveEasy, a software package for creating, modifying and analyzing waveforms is also included. The virtual panel can be used to interactively program and control the instrument from a window that displays the instrument’s current settings and status. In addition, interface files are provided to support access to programming tools and languages such as ATEasy, LabView, C/C++, Microsoft Visual Basic®, Delphi, and Pascal. An On-Line help file and PDF User's Guide provides documentation that includes instructions for installing, using and programming the board.